Recently, my wife got a job off the island. This means that both of us need to commute and unfortunately our places of employment are 40 minutes apart by motorized vehicle on the highway. Our options for commuting were: using our one vehicle to transport us to both, buying a second vehicle or for me to buy a bike. I’ve been wanting to buy a bike for quite a while and this was my opportunity. I did a bunch of online investigating and talking to friends who bike. I was looking for a good commuting bike, but also one that I could take bike camping in the summer and possibly some longer touring in the future. I narrowed it down to a few options: VeloORANGE Campeur, Jamis Auroroa, Kona Sutra, Novara Rondonee, Surly Long Haul Trucker or Surly Cross-Check. I went to Craigslist and Ebay looking for a used bike, but didn’t find much and I was unsure what size frame to get. I wanted to talk to someone about the options and get properly fitted, and only Surly had a dealer in Portland. So, I went into Gorham Bike and Ski to talk about buying a Long Haul Trucker or a Cross-Check. They were really knowledgeable and reiterated a lot of the information I had found online about comparing the two bikes. You can’t go wrong with either of them. The Cross-Check is lighter and quicker. The Long Haul Trucker rides smooth even with a heavy load. The Long Haul Trucker has more braze-ons for fenders, racks and panniers. This year’s Cross-Check model comes in orange! After visiting I was still unsure which bike I wanted, but I walked away with what I really needed: a rough price including the accessories I wanted. I thought about it overnight (as well as prowling more cycling forums), and returned to Gorham Bike and Ski the next day to make my purchase. What it came down to was that I wanted a bike with which I could tour and the Long Haul Trucker was better set up for that. Yes, the Cross-Check may have been the better choice for a commuter bike, but trust me, I wasn’t worried about getting to work quickly. It also helped that I saw many comments stating that if they could only own one bike it would be a Long Haul Trucker. A week later my wife called me at work to let me know that my bike was ready. I left work early to swing by the bike shop once more and pick up my bike. After some small adjustments and purchasing a protection plan the bike was mine. I parked my car and spun around the parking lot a few times to get used to my bike and then walked it down to the boat. I was far too unfamiliar with the bike and unsure of traffic to ride through Portland. Thus began my weekend-long trepidation for my first day of commuting. But, after spending the weekend route planning, researching bicycle safety and signaling and reading my state laws I felt much more confident hitting the street. I must say that I love my Long Haul Trucker and don’t suffer any buyer’s remorse. I have done some calculations and assuming an average price of $3.00 per gallon of gasoline, I will pay off my bike in 288 commutes (or roughly a year) based on the car mileage saved. Assuming I would have have purchased a used Toyota Tacoma from a local dealership I trust and assuming the same $3.00 gas price, it would have taken 2750 commutes (or 10.5 years) for it to pay itself off, not considering registration, parking, and maintenance. I was very happy with my choice to go to Gorham Bike and Ski (no affiliation). They were knowledgeable and not a bit intimidating (I walked in a total cycling noob). They also offered 10% off all accessories when purchasing a new bike and a free 30-day checkup (where accessories are once again 10% off). I look forward expanding my wandering possibilities by leveraging my Long Haul Trucker and sharing those experience on this blog. I have already dreamed up plans to bike down The Eastern Trail, bike camp in the White Mountains, bike to Burlington, VT, and a Portland to Portland cross-country trip (in ascending ridiculousness order). “Gorham Bike & Ski.” gorhambike.com. Gorham Bike & Ski. Web. 11 April 2015. “Long Haul Trucker.” surlybikes.com. Surly. Web. 11 April 2015. “RaceRocket.” topeak.com. Topeak, Inc. Web. 11 April 2015. “Specialized Bicycled Helmets.” specialized.com. Specialized Bicycle Company. 11 April 2015. “Surly Long Haul Trucker or Cross-Check.” google.com. Google, Inc. Web. 11 April 2015. “Thule Pack ‘n Pedal Tote.” thule.com. Thule Group. Web. 11 April 2015. “Top 100 Touring Bicycles.” bicycletouringpro.com. Bicycle Touring Pro. Web. 11 April 2015. 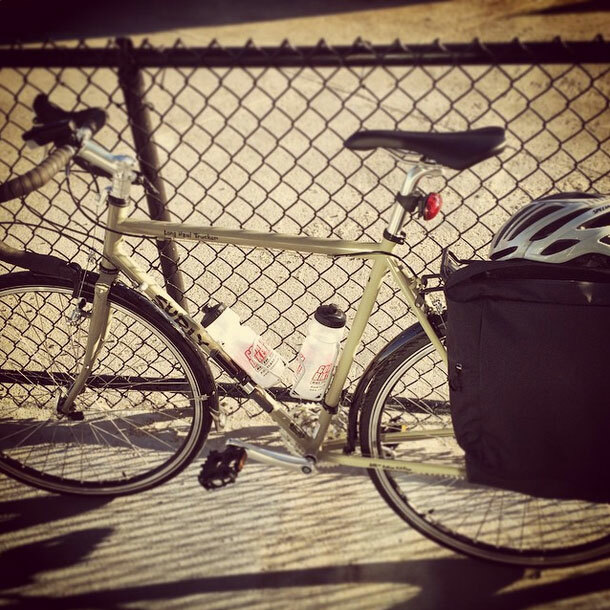 This entry was posted in Cycling, Gear, Side of the Road and tagged Backyard Adventure, Cycling, gear, LHT, Long Haul Trucker, Maine, Portland, Surly. Bookmark the permalink. Yay! Congrats to Missy on her new job and to you on your new bike! We bought both of the girls bikes from Gorham bike and ski and they (and the bikes) are wonderful. Happy cycling!